4 quads, 16 players and lots of excitement! That is what made up this week’s Winter G/45 Quads. It was an especially unpredictable night as many of the players seeded 3rd or 4th ended up winning their sections. The top quad was yet another strong master quad. This time it was 4th seeded FM Nelson Castaneda who stormed the field. Castaneda only gave up one draw to the newly crowned CT Champion NM Ian Harris. In quad two, third seed Jason Shi won with a perfect score, defeating two strong experts along the way. Again, in the third quad, 4th seed Leo Bykhovsky has a spectacular result finishing with 2.5/3 and picking up almost 60 rating points! 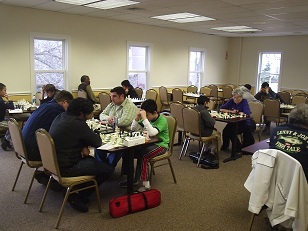 Finally, in the last section, top seed Christian Baccay managed to barely retain his position atop the table. 2/3 was enough for him to win by a narrow half point margin over Michael Morin and Vincent Xu.